The Swiss Plateau might look flat from above, but both the bird’s-eye view and its name are deceiving; it is, in fact, peppered with hills. I realize this while biking it, heading from my apartment in Prevessin, France, to the CERN Control Center. Despite covering just over a mile, the ride makes me break into a sweat. It’s Friday, July 13. While the professional cyclists zip through the Alps during their annual race across France, I have decided to do my own, slightly smaller version of the Tour, this one around the Large Hadron Collider at CERN. Over two days, I will follow CERN’s “Passport to the Big Bang” bike route. I’ll go behind the scenes to visit each of the LHC’s four major experiments and meet with some of the people who work here. The LHC is the world’s biggest and most powerful particle accelerator. It is a continuous 16.6-mile ring of custom machinery buried more than 300 feet underground in the bedrock between the rugged Alps and the ancient Jura mountains. While most of the LHC passes under houses, farmland and the toes of the Jura, the “Passport to the Big Bang” route approximates the LHC’s subterranean path on the nearest roads and trails. My journey starts at the CERN Control Center, a large, boxy building with high ceilings and four rings of computer monitors in a clover-leaf design in the main room. The CCC is the heart of the CERN accelerator complex. It brings operators, engineers and physicists into the same room to remotely operate and monitor the network of machines. I arrive around 9:30 a.m. I say hello to Michaela Schaumann, one of the Engineers in Charge responsible for the smooth operation of the accelerator. I met Michaela a few years ago in my CERN yoga class (which happens to be taught by another accelerator physicist). Last year we made it through an entire phone interview about a special run of the LHC (in which the accelerator collided xenon nuclei) before she asked if I was the same Sarah she knew. 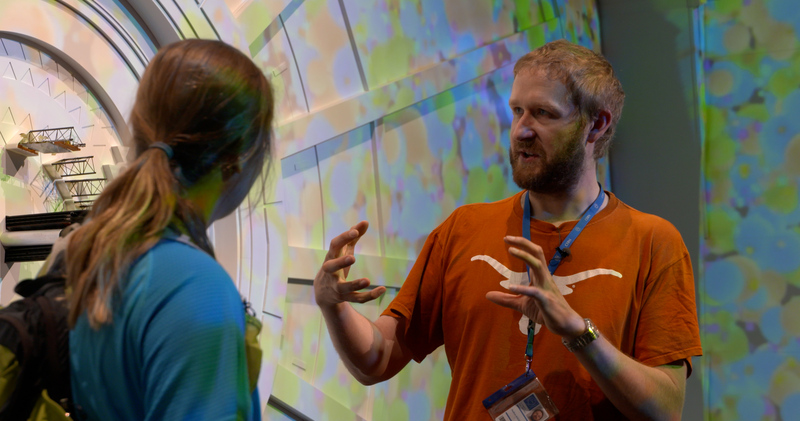 More than 10,000 people work on the CERN campus, yet it can be a small world. Michaela will be on shift in the control center today from 3 p.m. until 11 p.m., so she heads home to rest up and I continue toward my first experiment on the LHC ring. I roll back down the hill on a highway and take a shortcut across a gravel trail into Switzerland. Then I weave back into France and bike under a sign reading “CERN LHC point 8 – LHCb.” I pass shoppers pushing grocery carts as I follow a road through a large commercial center, around a McDonald’s and to an industrial building at the back. Sarah bikes through the commercial center near LHCb. Bolek poses at a “Passport to the Big Bang” visitor point. Sarah bikes on a dirt path near the French-Swiss border. As I arrive, I see physicist Bolek Pietrzyk walking toward me. Bolek has worked at CERN for 46 years. He is one of the most passionate physicists I know; he frequently knocks on my office door or finds me at the coffee machine to share the latest LHCb results. He scans us past the gate and brings us into the LHCb control room, where scientists are monitoring the detector and data from the hundreds of millions of particle collisions happening every second in the LHC. With 1370 scientific collaborators, LHCb is the smallest of the four main LHC experiments. The LHCb detector is designed to study the differences between matter and antimatter, two types of particles that appear to be almost identical, except for their opposite charges. Matter and antimatter seem to be two sides of the same coin: When a particle of matter is produced, its partner particle of antimatter is always produced at the same time; and when those two particles meet, they annihilate. But if matter and antimatter always arrive and leave together, then why are we left with a disproportionate amount of matter after the Big Bang? Where did the equal amount of antimatter go? LHCb investigates the properties of matter and antimatter and looks for subtle differences that could have led to the imbalance. Gareth and I walk across the parking lot so he can show me the “cold box,” which is responsible for cooling the LHC’s helium to 4.5 Kelvin (minus 452 degrees Fahrenheit) before sending it underground, where the cooling continues until it’s superfluid helium. It always surprises me just how much is hidden away just behind my local commercial center. It’s getting close to 1 p.m., so I continue toward the next stop of my Tour. I take a shortcut across a bumpy dirt trail, through farmland dotted with hay bales. I plan to eat lunch at main CERN site before moving on my next LHC access point, the ATLAS experiment. On the way, I stop to pick some wild blackberries, but I quickly discover that I am wading through stinging nettle. I hop back to my bike with burning ankles. Sarah arrives at the mural outside the ATLAS visitor center. Sarah and Claire talk outside the ATLAS control room. The ATLAS experiment is located just across the street from the main CERN site in Meyrin, Switzerland. It is the only LHC experiment located in Switzerland; the majority of the ring goes through France. Of the four LHC experiments, ATLAS takes up the most volume. It is roughly half the size of the Notre Dame Cathedral in Paris. Claire is a physicist at Brookhaven National Laboratory and has lived in a village in the Jura mountains behind CERN for the past seven years. Today her husband is on a work trip, so her son, Cabhán, is joining us as well. Unlike LHCb, the ATLAS experiment is a general, all-purpose detector. Scientists sift through its data to study and search for scores of different types of physical phenomena. After refilling our water bottles, Claire, her son and I set off on our bikes toward my next stop, the ALICE experiment. To slow traffic, the Swiss government set up permanent orange barriers at the border with France. I stop frequently and look behind me to make sure everyone is doing OK going through the resulting zig-zagging obstacle course. “Want some energy?” Cabhán asks, as he rolls up to me holding a bag of candy. “Absolutely!” I say as I take one. Then a second. Anders describes the quark-gluon plasma at ALICE. After about 15 minutes, we arrive at ALICE just in time to see Anders Knospe racing in from behind us on his bike. Anders is a postdoc at the University of Houston. He has worked on ALICE for seven years. Claire and Anders have known each other for a long time, but this is the first time Claire has ever visited Anders’ experiment. From where I sit in the press office, it’s easy to forget just how specialized the scientists’ jobs can become. Most cosmologists think that that our universe was a hot and dense soup of fundamental particles called quarks and gluons roughly one second after the Big Bang, when it was still too hot for protons and neutrons to form. There’s also good evidence to suggest that this material exists now, in the center of neutron stars. ALICE scientists hope that if they can identify the properties of this primordial material, they can better understand how it evolved into the entire universe. After our visit to ALICE, it’s already 5 p.m. I ask Anders if he’s still game to bike with me to my next stop, LHC Point 4. “Sure, why not?” he says. Today, Point 4 houses the LHC accelerating cavities. Most of the machinery in the 16.6 miles of the LHC ring is dedicated to bending and corralling protons onto the correct path; just about 26 feet of the ring is dedicated to acceleration. It works like pushing a kid on a swing. You give them a little push, wait for them to swing back to you, and then give them another little push. Over time, the energy builds up. In the case of the LHC, a proton’s energy is increased 14-fold over the course of 20 minutes. By the time the protons are ready to collide, they’ve been pushed by the accelerating cavities 13 million times. The trail from ALICE to Point 4 is a narrow gravel road. Immediately behind the experiment is a small enclosure with geese, chickens and even an agitated-looking peacock. We take a wrong turn and come to a dead end in a field. The path is a mixture of farmland and forest, and at many points we have to get off our bikes and walk over big, loose stones. I imagine the LHC running under our tires. It’s so sensitive that it can sense tremors from an earthquake happening on the other side of the world, but so deep underground that the massive farm equipment currently winding wheat into hay bales directly above it has no impact. The path starts to climb as we reach the foot of the Jura. This mountain range is much older than the Alps and reminds me of the Appalachians in Maine. The Jura are short, compared to the Alps, but that doesn’t mean they’re not steep. The bedrock beneath us is sloped; to stay within a single layer of it, the LHC tunnel is actually slightly tilted. Everything has to be expertly calibrated to compensate for this minor incline. How I wish I were underground in that cool, smoothly paved tunnel as I haul my bike over rocks in the oppressive afternoon heat. Anders and I finally pop out of the woods near the source of the Allondon River. We lock our bikes and take a steep, dirt path to a beautiful, clear pool. The Allondon comes directly from a natural spring, so I fill my water bottle right where it bubbles from the rocks, take off my shoes and socks and wade into the icy water. I let out a yelp as my feet slip on the rocks and I dunk under much faster than I had planned. We get back on our bikes, and after another 10 minutes, we finally arrive at LHC Point 4 in the small French village of Échenevex. It’s already 7 p.m., but the gate to Point 4 is still open, and the security guard is still on duty. Other than that, it is completely deserted. Anders takes out a Tupperware container filled with orange slices. “Do you want one?” he asks. “Yes,” I say as I take one. Then a second. It’s getting late, so we head back toward our respective homes. Luckily, Anders has printed out his own map and marked a slightly easier path. We follow it back to ALICE and part ways. Riju and Sarah visit Point 5, home to the CMS experiment. The second part of my Tour starts a week later, on Friday, July 20. I cheat a little bit; I get a ride from CERN’s main site to my next stop, Point 5, home to the CMS experiment. Today I’m killing two birds with one stone and bringing along a novelist who requested to visit CMS—just because I’m biking doesn’t mean I get to slack on my press officer duties. 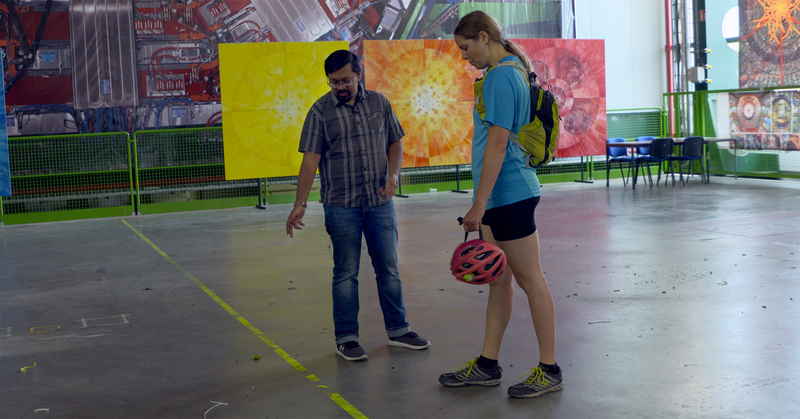 My friend Riju Dasgupta, a graduate student at UCLA, drives the novelist to Point 5 while videographer Christoph Madsen and I twist and shove two bikes into a CERN van until we can finally close the trunk. The way to CMS is a 25-minute drive through winding roads in quaint neighborhoods. A few years ago, my supervisor and I wound up lost on this route with journalist John Timmer. (Our little misadventure eventually made it into his article about CERN.) I wonder how we’ll do finding our way back to CERN’s main site via bicycle. When we arrive, Riju takes us into a large open building with a 50-foot poster of the CMS detector on the wall. Most of the LHC access points were originally built for the previous inhabitant of the LHC tunnel: the Large Electron-Positron Collider, or LEP. But the experimental cavern at Point 5 was built specifically for CMS. When digging the cavern, excavators found Roman ruins and had to stop their work while archaeologists catalogued and removed artifacts. When the work restarted, they ran into the water table. They ended up freezing the soggy dirt with liquid nitrogen and installing concrete supports. I wonder how many other places use liquid nitrogen to solve construction problems. After wandering into the control room and chatting for a bit with a few friends on shift, we meet up with David Yu, a postdoc at Brown University whom I invited to join the next leg of the ride. David is dressed like he’s ready for the real Tour de France. He is part of the Geneva cycling club and regularly races up and down the Jura. Luckily, he’s a little tired after sprinting to Point 5 today (a more than 12-mile ride, all uphill), so he takes it easy on us. David, the novelist and I cruise downhill toward Point 6, the LHC beam dump. The crew bikes from CMS to Point 6. The LHC passes underneath villages and farmland. The beam dump, buried like the LHC tunnel underground, consists of a long cylinder of graphite surrounded by huge blocks of concrete. Whenever the LHC operators want to empty the accelerator of protons, they spiral the beam into the graphite. Point 6 is located down a deserted road in the middle of a forest. The first time I came here, it was by accident. I got lost in the woods on my way home from a bike ride. Suddenly, my small forest trail ran up against a huge industrial complex. I felt like one of the kids in the Netflix series Stranger Things. What was this thing doing in the middle of the woods? And then I popped out in a parking lot and saw the “Passport to the Big Bang” visitor point and CERN logo. Of course it was CERN. Little bits of CERN are hidden all around. Even the little gardening shed I pass every day on my morning commute turned out to be a CERN building. A security guard comes out. I chat with him a bit in broken French and tell him about our project. I ask him if people ever come here. “C’est très tranquille,” he responds with a sigh. Apparently, the only people here today are a few electricians fixing some lights in the building. David has a meeting with his boss at 2 p.m., so we get back on our bikes and ride toward Point 7. The novelist talks about how astounded she is at the French villages we pass. David and I look around at scenery that has become too familiar for us to notice. We hear a low grumble behind us, and we all turn to look. Even though we’re still under a blue summer sky, a wall of dark purple clouds is gradually creeping toward us from over the Jura. We decide it’s time to go. We travel through villages that grow busier and busier as we get closer to the Swiss border. We cut through the edge of Ferney-Voltaire, whose name honors the French Enlightenment author. Voltaire owned a chateau there, but today I think of the village as the place where CERN graduate students and postdocs move when they give up on finding affordable housing in Geneva. Public transportation between Ferney-Voltaire and Geneva—on the elusive Y bus—is such a pain that in my early days at CERN I considered it a black hole; once people moved to Ferney-Voltaire, you never saw them again. Of course, now I live right next door. As we approach Point 8, both the beginning and end of my Tour, we suddenly find ourselves in a wide open field. We’re almost right behind my apartment, yet until this moment, I have never seen this area. We leave our bikes and climb up a small hill to get a better view. The long, yellow grass punctuated by dark trees reminds me of California, where I grew up. It’s strange how something can be so foreign and yet so familiar at the same time. I guess that’s why we humans do science in the first place: We take something we think we know inside and out, then we push all of our assumptions to the limit to see if we can learn something new. There’s always room to be surprised.